Philadelphia rapper Meek Mill spoke to NBC Nightly News' Lester Holt a day after he was released from prison. He discussed what he plans to do next and his plans to help others. 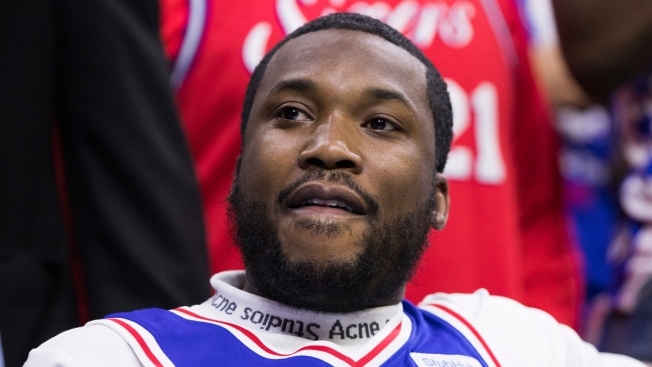 Rapper Meek Mill said Wednesday that now that he's out of prison, a lot of people facing similar battles with the criminal justice system are depending on him. The Philadelphia-born rapper rang a replica Liberty Bell at center court of the Philadelphia 76ers' first-round clinching playoff game Tuesday less than two hours after being freed on bail while he appeals decade-old gun and drug convictions. Asked if he felt free, Mill told Holt: "I ain't feel free since I caught this case at age of 19 — I'm 30 now." "Although I'm blessed to have the resources to fight this unjust situation, I understand that many people of color across the country don't have that luxury and I plan to use my platform to shine a light on those issues," Mill said in a statement shortly before his release. The ruling came after prosecutors said they agreed with his lawyers that he should get a new trial because of questions raised about the arresting officer. The now-retired officer was among a list of police officers the prosecutor's office has sought to keep off the witness stand in cases across the city because of credibility questions. The district attorney's office has not said whether they would seek to retry him if the old convictions are thrown out. But it noted that just last week, prosecutors agreed not to further prosecute three defendants whose cases were tossed because of doubts about the credibility of the arresting narcotics agent, the same officer who had arrested Mill. Judge Genece Brinkley, who sent Mill to prison and had refused to release him on bail until the Supreme Court ruling, was accused by the defense of waging a vendetta against the rapper. She defended herself, saying she had acted "impartially and without prejudice" in all proceedings since 2008.